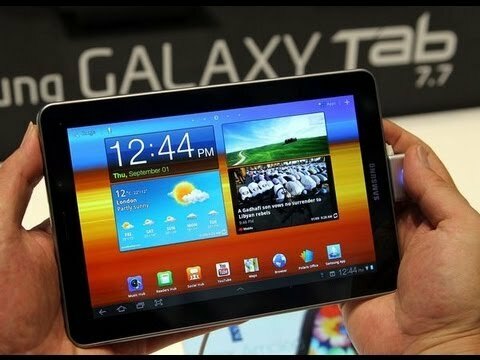 Samsung Galaxy 7.7 is a tablet that comes with SMS, MMS and GSM voice communication. Samsung Galaxy 7.7 was announced in September 2011 and released in December the same year. It is compatible with 2G and 3G Networks. It can operate on GSM 850 / 900 / 1800 / 1900 2G networks and on HSDPA 850 / 900 / 1900 / 2100 3G networks. Here are the complete Samsung Galaxy 7.7 specs. Samsung Galaxy 7.7 weighs about 340 grams or 11.99 oz and measures about 196.7 mm by 133 mm by 7.9 mm. It sports a Super AMOLED Plus capacitive touch-screen that supports 16M colors, has a resolution of 800 by 1280 pixels. The 7.7 inches display supports multi-touch and has a pixel density of 196 ppi. Samsung Galaxy 7.7 offers vibration alerts, MP3 and WAV ringtones, a loudspeaker with stereo speakers, a universal 3.5 mm jack with DNSe sound enhancement. The memory card slot has a capacity of 32 GB of external storage. There are choices in regards to internal storage and you can opt for either 16 GB or 32 GB. You can also opt for 64 GB integrated or in the box through a combination of internal and external memory. Samsung Galaxy 7.7 has 1 GB RAM, Class 33 GPRS and Class 33 EDGE. With Samsung Galaxy 7.7, you can enjoy HSDPA speed of 21 Mbps and HSUPA speed of 5.76 Mbps, Wi-Fi hotspots, WLAN connectivity, Bluetooth v3.0 and USB v2.0. The tab comes with a 3.15 MP primary camera with LED flash, autofocus, geo tagging and can record videos at 720p at 30 frames per second. There is a secondary 2 MP camera. Samsung Galaxy 7.7 is powered by Android OS, v3.2 (Honeycomb), Exynos chipset, 1.4 GHz dual core Cortex-A9 processor and Mali-400 graphics accelerator. 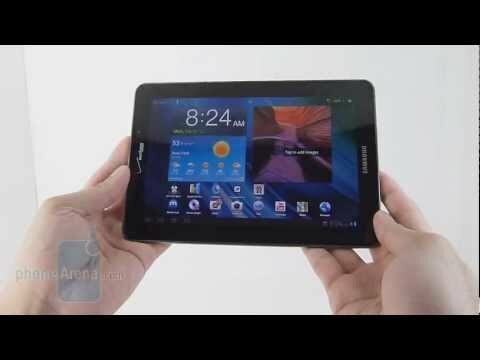 The tablet has gyro sensor, accelerometer, proximity sensor and a compass. You can enjoy all forms of messaging including SMS displayed in a threaded view, MMS, Push Mail, Email, Instant Messaging, HTML browsing, Adobe Flash, GPS and JAVA. Available in black, Samsung Galaxy 7.7 offers SNS integration, TV Out port, MP4/DivX/Xvid/FLV/MKV/H.264/H.263 player, MP3/WAV/eAAC+/Flac player, Organizer, – Image/video editor, Quickoffice HD editor/viewer, Google Search, Maps, Gmail, YouTube, Calendar, Google Talk, Picasa, Voice memo/dial and Predictive text input (Swype). Samsung Galaxy 7.7 has a non-removable Li-Po 5100 mAh battery that offers up to 1200 hours of standby on 2G and up to 1100 hours of standby on 3G. It offers up to 34 hours and 10 minutes talk-time on 2G networks and up to 20 hours on 3G.